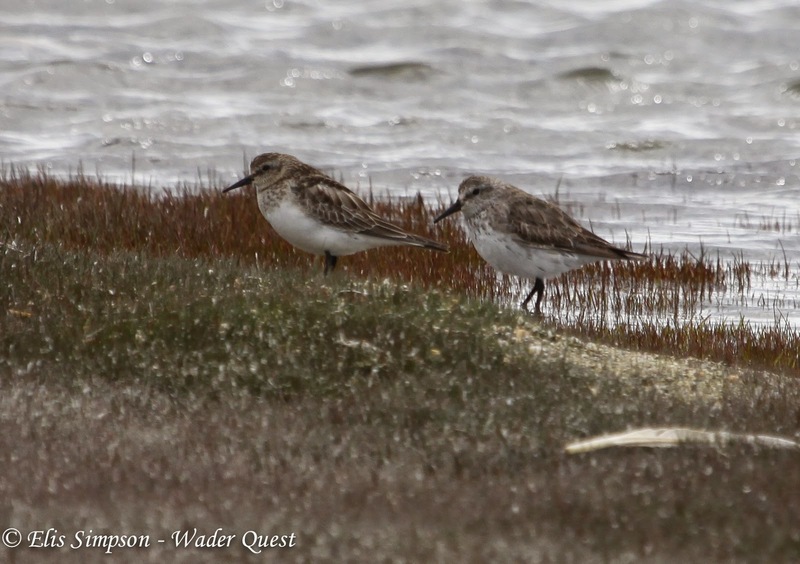 Wader Quest: Separating Baird's and White-rumped Sandpipers. Separating Baird's and White-rumped Sandpipers. If, like us, you've always thought that telling a Baird's from a White-rumped Sandpiper was nigh on impossible and only for the experts, then this blog may help you. Although we haven't seen these species in all plumages (notably not juvenile Baird's), we think that now we have cobbled together enough experience and knowledge to tell the difference, so, here's how we do it. Look how horribly similar these two birds are! If you look at the colour and pattern of the upperparts they are almost identical, the brown mask and brown cap also very similar. But if you look at the back end of the bird and flick your eyes from one to the other you can detect that the bird on the right looks so much more pointed; attenuated they call it in the books. Look more closely and you'll see why. The bird on the right is a White-rumped Sandpiper in breeding plumage and you can see that its wing tips are noticeably beyond the tail tip. The other bird is a Semipalmated Sandpiper in breeding plumage and its wingtips are more or less in line with the tail tip. The birds behind are Dunlins. Connecticut, USA 17/05/2012; Both photos Elis Simpson. So, we have seen the projecting wing tips so we know we have a Baird's/White-rumped to deal with. Naturally we do not encourage anyone to flush a feeding or roosting bird to make it fly, but if your bird does fly or preen itself conveniently, as one did for us at Cley on the first day of Wader Quest back in 2012, then you will not find it hard to spot the white uppertail coverts on the White-rumped Sandpiper, or, if your bird is a Baird's, that this feature is absent. White-rumped Sandpipers do not have white rumps! As you can see they have white uppertail coverts. We don't have a suitable photo showing a Baird's rump and uppertail but trust me, they do not have white rumps, uppertail coverts or anything remotely similar. If you see this feature, you can forget the rest of this blog. São Paulo, Brazil 25/11/2011. As conscientious birders you will not want to disturb the bird and the other birds around it, so you may have to make your identification based on other features. A lot of books talk about the Baird's being browner, but if you have a single bird, comparisons of this nature are useless, especially as tones and colours depend so much on light condition. So what do we look for? Well we often start with looking at the flanks of the bird. In Baird's it will normally be clear white, whereas on White-rumped you will usually be able to detect some dusky streaks. Although Baird's will sometimes show one or two fine feather shaft-streaks high up on the rear of the flanks; there is one on this bird. Here the flank markings can be seen on the White-rumped Sandpiper (right) quite clearly whilst the Baird's Sandpiper (left) has unmarked flanks. Baird's Sandpiper, Antofagasta, Chile 31/10/2013 - White-rumped Sandpiper; Rio Grande do Sul, Brazil 25/10/2013. A further pointer is the bill. That of the Baird's is straighter and finer than White-rumped's with a narrower tip. 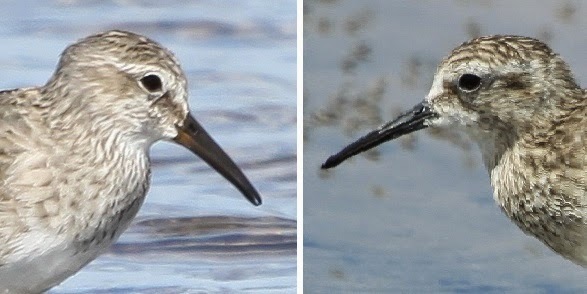 If you can compare the two it is fairly obvious, but again a lone bird may not be so easy and there is some degree of individual variation, however you may find another useful feature often apparent on the bill of White-rumped Sandpiper, is a brownish patch at the base of the lower mandible. There is also a feature that I have not seen written anywhere, but looking at the base of the bill where the feathers end, on the lower mandible of Baird's Sandpiper it seems to extend much further forward along the bill then on the upper mandible; on White-rumped, although the lower feathering is further forward it is much less markedly so. Looking at many photos on the internet and in books, although this is not absolutely diagnostic in all individuals and the angle the bird is seen at can make a difference, it does seem to hold true in general. I would described the detail in Baird's as looking like the profile of a person whose bottom lip protrudes slightly. White-rumped Sandpiper (left) shows a less straight bill although the curvature on this one is rather exaggerated, the culmen (top edge of the bill) can often be as straight as the Baird's Sandpiper but it is not as finely tipped, is broader based and tapers more. It also shows the tell tale brown spot at the base of the lower mandible. Here too the feature of the feathering at the base of the bill can be seen quite clearly. Baird's Sandpiper, Antofagasta, Chile 31/10/2013 - White-rumped Sandpiper; Rio Grande do Sul, Brazil 25/10/2013. Both photos Elis Simpson. Call is often cited as a distinguishing mark too, but to be honest with you, the chances of hearing one call on its own, in isolation, in the general hubbub and din of a marsh and its denizens, or over the crashing waves on a beach, without actually disturbing the bird, are small. I'm not sure about you, but I'm not confident I'd be able to tell them apart in isolation anyway. Listening to the two one after the other on xeno canto it is possible to hear that the calls of the White-rumped are more squeaky, high pitched and, I think mouse-like, and those of Baird's more bubbly and liquid in tone, but to hear one on its own? I know my personal limitations and I would not be happy if I couldn't see a visual identification feature. In the above photo there is one of each of the species, taken in conditions in which you typically may well see them, not up close and in feather perfect detail in good light, but a little distant and in a gloomy overcast ambience. However, given everything we have said above, even though all the features are not visible, you should now be able to see enough to tell which is which here... Tierra del Fuego, Chile 06/11/2013. If you identified the birds above as Baird's on the left and White-rumped in the right you'd be spot on. See? It's not that hard after all... is it? You are very welcome, hope you found it useful. Best article I've seen of this issue. Hope it helps me find my first Baird's. Thanks Barry. Good luck with finding your Baird's, let us know when you do. You may also find this interesting and even useful.